Earlier in the week I was very lucky to find a pair of Ferruginous Hawks along a quiet country road near the town of Hanley. 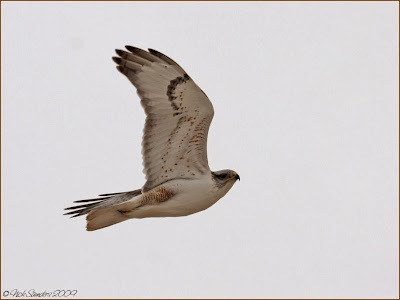 Ferruginous Hawks are our biggest Buteos here in Saskatchewan. Light morph birds like this pair have a rusty brown or 'chestnut colour' on the upper parts and are pale on the head, neck and underparts with rust on the legs and some rust marking on the underwing. 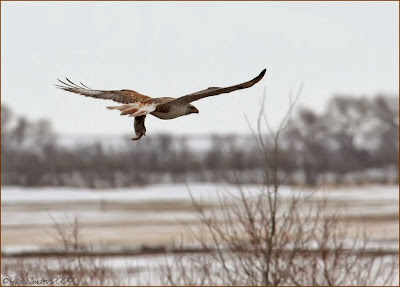 These are the true prairie hawks and seeing them this far north is pretty rare. On the day these were seen it was incredibly windy and cloudy, but there was an abundance of prey out in the open fields. In one photo you will see a Richardson's Ground Squirrel that had just been caught. Beautiful series Nick. The first image is a spectacular composition. The camera angle makes the bird look menacing. 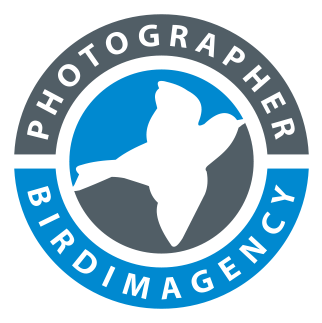 Beautiful bird and spectacular shots. Another new bird for me. We do not get these in Ohio. I really need to get out west to do some birding. It's about time! LOvely shots.Love the last one in particular. Beautiful! I loved seeing the hawk's legs tucked underneath him as he flew. Another new Hawk for me. Superbly captured Nick showing the contrast between the upperwing colours & the pale underparts. Great. 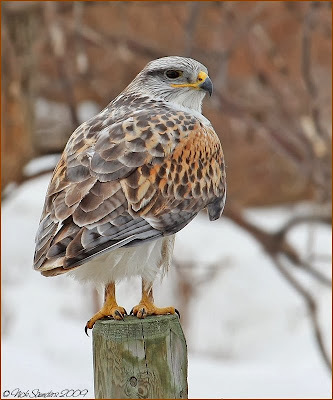 What a lovely hawk the Ferruginous is! I've never seen one. Thanks for your comment on my blog, Nick...I look forward to seeing your feature! I've been a field editor since the magazine started. The circulation is over 2 million now! Congratulations! Your photography is outstanding and I'm glad that lots of people will get to enjoy your efforts! Quite a handsome predator ! Excellent images Nick despite the poor light.